Low prices. OrangeSmile.com offers car hire service in Sweden on the lowest-rate-guarantee basis, since we work with car suppliers directly. 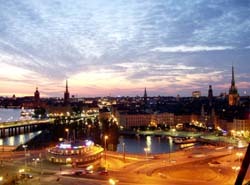 For your search criteria in Sweden, we always select and show the best rental offers. The car reservation process consists of 3 simple steps: (1) search for available cars for your dates in Sweden; (2) select your car type; and (3) fill in the booking forms. Once the reservation is completed, you will receive a confirmation voucher to your email address. During the booking process, please check your rental conditions. To pick up your car at the rental point in Sweden, you need to provide our confirmation voucher, your driving license and a valid credit card. The final payment is normally carried out at the pick-up point. Our car hire points in Sweden accept VISA, MasterCard, etc - please check your rental conditions. At the pick-up point, please read the handling manual and check the car for present defects. OrangeSmile.com wishes you a pleasant journey to Sweden! The car hire reservation system OrangeSmile.com allows renting a vehicle in Sweden within 10 minutes. Our largest database of car suppliers enables us to provide you a rental car in Sweden at the cheapest rate ever possible. At rental locations in Sweden we offer the following car sizes: mini, compact, economy, standard, premium and luxury. The following car types are available in Sweden: Sedan, Hatchback, Jeep, Cabriolet, Coupe, Minivan and Minibus. The most famous landmark of the Renaissance period is located in Malmo. Here travelers are welcome to see a beautiful castle built in 1434 by order of Erik av Pommern. Besides the building, don't forget to take a look at the beautiful garden located nearby. The large and skillfully decorated garden is divided into several thematic zones. The garden and the park zone in front of the castle have become a popular venue for various concerts, theatre performances and other events. The castle itself is home to three museums, one of which exhibits a large collection of pictures made by famous Russian artists. Which is the largest collection of Russian Art outside its home country. When returning a vehicle in a different city, the price will include additional costs for logistics operations. For this reason, the best option for budget travellers is to pick-up and return a car at the same location. Rental terms for young drivers in Sweden can be different from the standard ones. If you are under 24, you should check your rental conditions carefully.